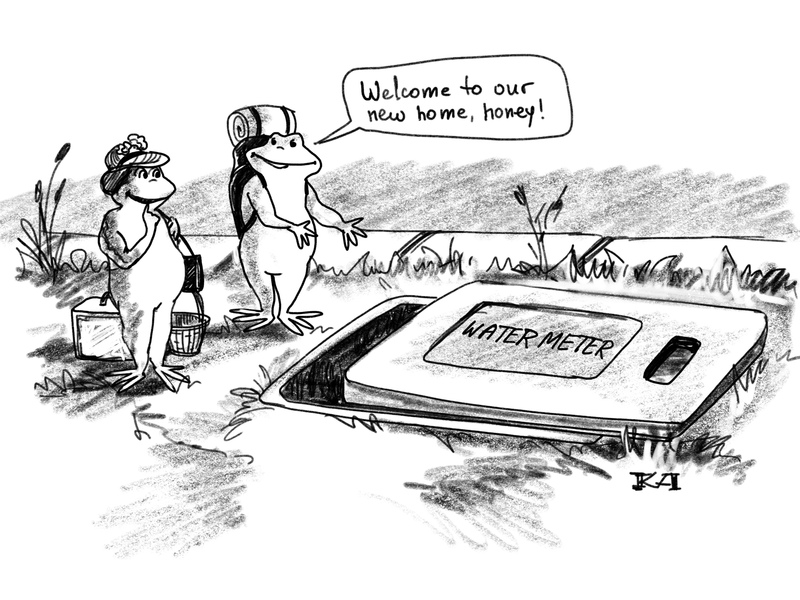 d. The water meter is installed underground in a box. The box can be either plastic or concrete. The lid for the box may be plastic or steel. It may be hinged or it may just fit tightly. A note of caution about black plastic lids, the most common type in Houston. They float! 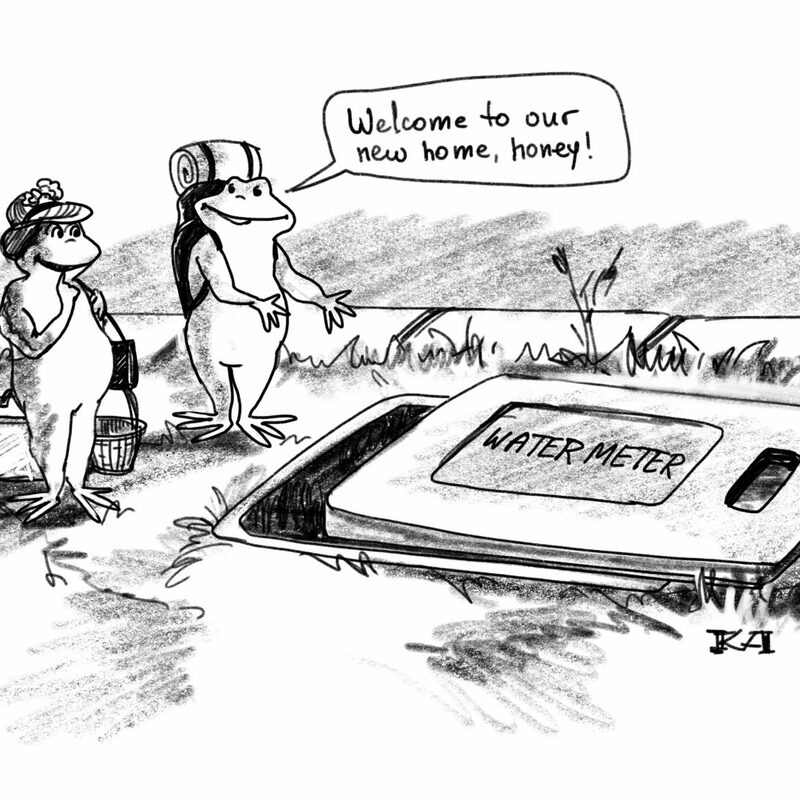 Houston residents know we get a lot of rain and thousands of water meter box lids go floating away every day. 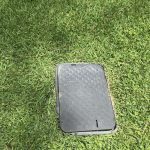 Be sure your water meter box lid is installed correctly and nice and tight to avoid losing it in the next big rain event. Once you locate the meter box, use a screwdriver or other tool to pry open the lid. Use caution as various critters think the water meter box makes a nice home. Somewhere inside the box there is a round dial with a hinged cover. It may be buried under leaves and soil so be prepared to get you hands dirty looking for it. Don’t use a shovel as you may damage the meter. Once you locate the meter, open the cover to expose the meter face. It is probably going to be dirty so be sure to have a damp rag handy to clean the face. Once it is cleaned you will probably see an analog style meter with an odometer style counter, a large red needle and a small red indicator. Other, newer meters may have only an electronic digital display. The small indicator or electronic digital display is what we are most interested in. This indicator rotates to indicate even the smallest water flow. If this indicator is not rotating, there is no water flowing. If it is rotating there is water flowing and we would then need to take some troubleshooting steps to determine if there is a leak in our water supply system. In future posts we will explore some other components of the water supply plumbing and learn how to troubleshoot for a leak.